Angelina Jolie, Obama and Gangnam-style star Psy are in Mumbai, and here for a while to stay at this wax museum that opened up in 2016 in the unlikeliest of places, Ghatkopar. So, yes, it does sound a little odd. R City has made a Red Carpet wax museum that we visited a few months ago. Needless to say, it was quite an entertaining walk. First thing that greeted us were flashing cameras with bouncing lights on the walls. Our first bolt from the blue came when we saw a security guard falling asleep on a chair, and we scoffed. A moment later, he didn’t move at all, and we wondered if he was okay. Further prodding and investigations proved that he was not hurt, he was just made of wax. 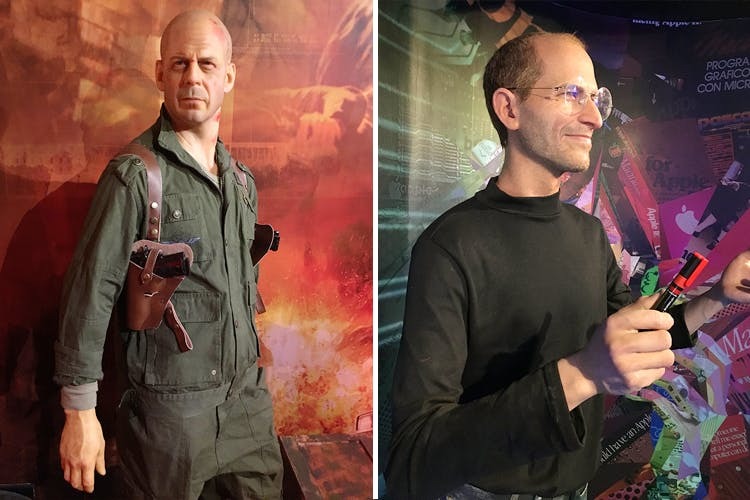 How extremely realistic Steve Jobs looked. Like seriously, if you weren’t aware he was dead, you could be taken for a ride here. We also liked the simple touches, such as the toy gun provided for you to pose with James Bond, light bulb hat at the Albert Einstein booth, giving you fun things to do at each corner. There were some other great surprises that would leave you shocked whether it is a real person or not, but we shall leave those for you to uncover. The only thing we missed was the presence of Bollywood celebrities. On a scale of Madame Tussauds to Lonavala Wax Museum (Tussauds being the highest), the Red Carpet Wax Museum proudly gets a score of 6.